This vibrant salad literally comes together in minutes, but it has enough substance for a weekend brunch, or a light weeknight dinner. With a vibrant palette of green, purple and coral, this salad entices with looks, yet satisfies on taste. 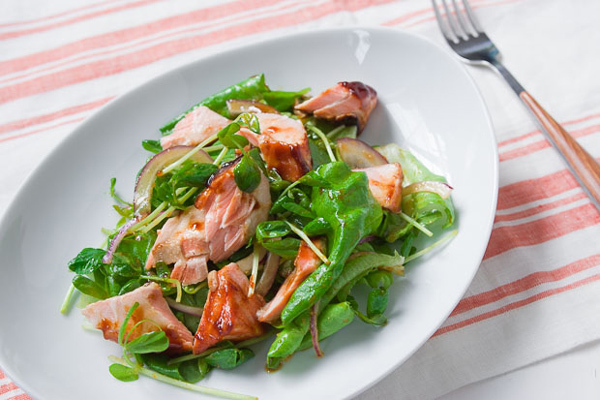 The crisp pea shoots and tender butter lettuce create a verdant foil which pairs beautifully with the sweet, nutty hoisin glazed salmon. 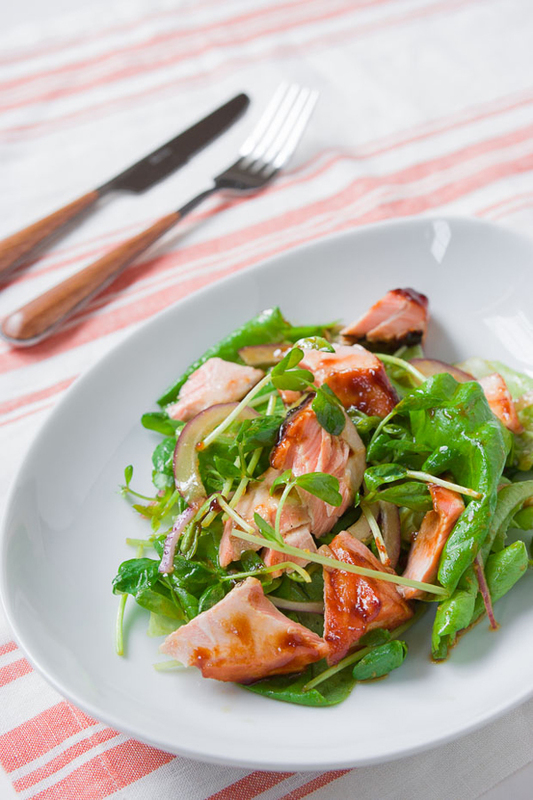 Dressed with a tangy Asian affair that’s redolent of ginger and sesame oil, the dressing complements the green tasting sprouts, while contrasting with the buttery salmon. Because the salmon is broiled at a high temperature, it’s best to use well marbled king salmon (especially from the belly), which tends to have the highest fat content. This ensures you end up with moist juicy hunks of salmon in your salad rather than wads of pink cardboard. This vibrant salad comes together in minutes and makes for a satisfying and colorful meal. 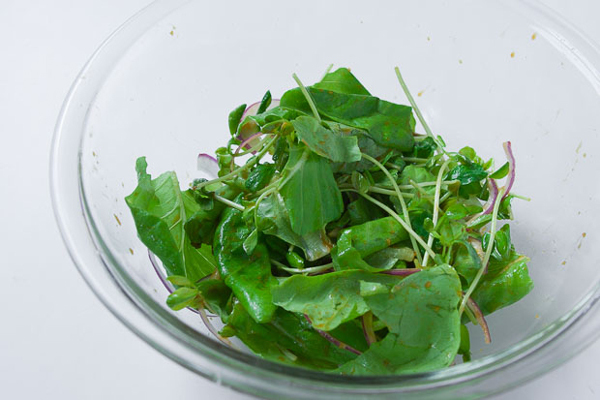 Cut the pea shoots and tear the lettuce into bite-size pieces. Add both along with the sliced onions into a bowl of cold water to crisp. Season the salmon with salt and white pepper on both sides, and then spread the hoisin sauce on both sides. Line a baking sheet with aluminum foil, and spread some vegetable oil where the salmon is going to go. 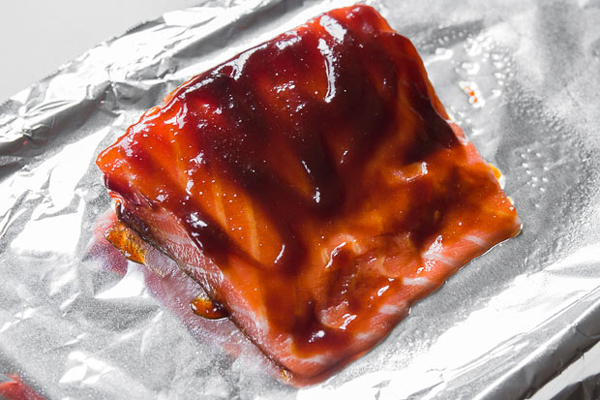 Place the salmon on the foil and broil in the oven until the salmon is cooked to your preferred level of doneness. 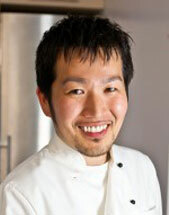 (The author recommends cooking the salmon to an internal temperature of 125 degrees F). Let the salmon cool a bit while you prepare the rest of the salad. Drain the greens, and then run them through a salad spinner to remove the excess moisture. To make the dressing, whisk together the sesame oil, 1 tablespoon of hoisin sauce, rice vinegar, soy sauce and grated ginger. Put the greens in a large bowl and toss with the dressing (you may not need all of the dressing). Plate the salad, and then crumble large chunks of grilled salmon on top.